Property Details: 2 BR, 2 BA Gulf-front Home with approximately 1220 sq. ft. The Castaways condominium home, Gulf Shores Alabama real estate sales. 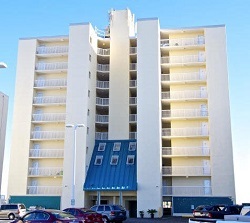 This 7th floor Castaways vacation condominium features a beautiful view of our white, sandy beaches of Gulf Shores. Walking distance to Pink Pony Pub, The Hangout, Sea-N-Suds, souvenir shops and much more! This highly desired vacation spot has been updated with new paint throughout, new furniture and decorations, new kitchen appliances and dishes and cookware, new flooring in bedrooms and dressing areas. You don't have to do anything! Income potential abounds. Master bedroom offers a king sized bed with fold out chair for extra sleeping and a flat screen TV. Access balcony through master bedroom as well as having a private bathroom and large walk-in closet. 2nd bedroom features a beautiful queen bed, TV and opens to 2nd bathroom. Kitchen includes all new stainless appliances, beautiful refinished counter tops and laundry area with new stacked washer/dryer unit. Dining area with breakfast bar seats 6 and is open to the great room with new sleeper sofa, recliner and comfy swivel chair. Open the double, glass, sliding, tinted doors and let that sea breeze in. Come see this resort home at Castaways Condos in Gulf Shores AL.